have a wealth of resources–excellent archives, and lots of them. In fact, there are so many repositories, so many stakeholders, so many handlers of records, and layers upon layers of city infrastructure to wade through, that everyone could use a guide. After spending years sifting through different kinds of records, housed in city, private, and public archives to professionally research the history of Philadelphia’s built environment, Lynn Alpert is an excellent guide. Lynn is a cochair of the Young Friends of the Preservation Alliance and a working public and architectural historian in the Philadelphia area. 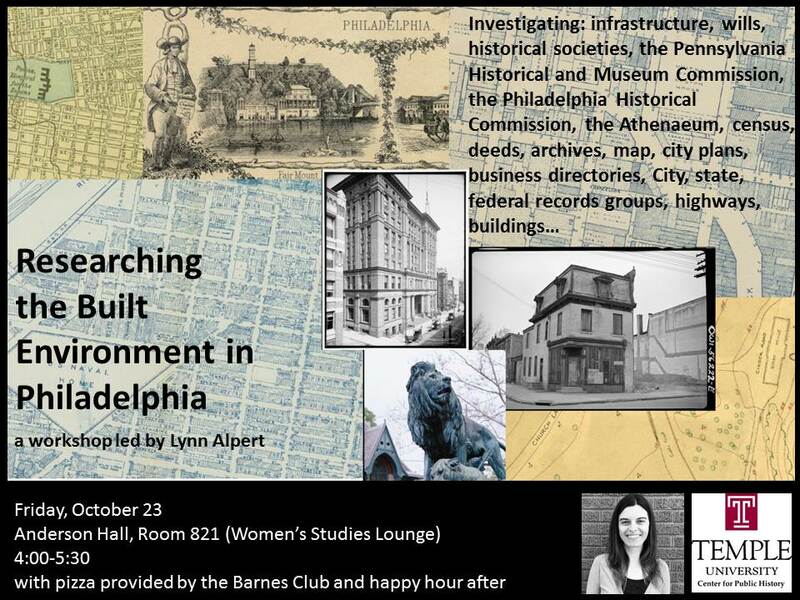 Join us for a workshop that will acquaint us all new resources, tools, and collections—and importantly broaden our research through the investigation of the built environment of Philadelphia. Event is sponsored by the Barnes Club and Temple’s Center for Public History. Everyone is invited to come learn about and discover The Woodlands at 5:30 pm on October 27th! 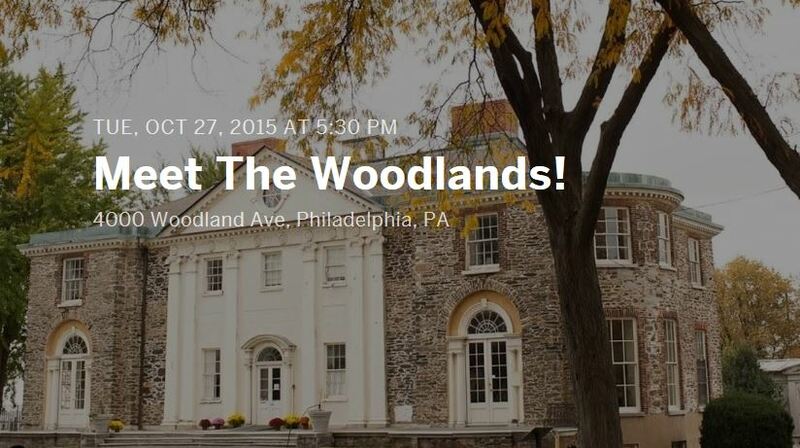 Enjoy cocktails and light hors-d’oeuvres, the ambient historic cemetery, receive a tour of the Hamilton Mansion from Woodlands staff, and hear about the educational outreach programs facilitated at The Woodlands. Temple University public history student Grace DiAgostino will present her research on and work with the Woodlands Cemetery Project, a collaborative endeavor between The Woodlands and J.R. Masterman’s Advanced Placement United States History class. Joana Arruda, another Temple University public history graduate student, will be offering tours of the historic cemetery! The Woodlands Cemetery, designated a National Historic Landmark District, is home to more than 30,000 “permanent residents.” Actively used today, the Woodlands Cemetery, its Hamilton Mansion, and 54-acre green space are an educational resource for scholars seeking further understanding of American architectural and botanical history, urban development, and the origin and growth of West Philadelphia. This event is planned by two Public History graduate students, Joana Arruda and Grace DiAgostino, and funded in part by the Temple University Center for Public History. Questions? Please feel free to contact Grace DiAgostino at grace.diagostino@temple.edu or Joana Arruda at arruda.joana@temple.edu. The fifth annual PubComm was held at the Arch Street Meeting House on Wednesday, April 22, 2015. PubComm stands for Public History Community Forum and is an effort to get public historians together to talk about hot issues in the field, learn about new projects, and to more-or-less have a good time! Organized by Temple University public history graduate students, Joana Arruda, Grace DiAgostino, and Maegan Pollinger, PubComm was attended by over fifty students, academics, and public history professionals. T he day began with eleven short presentations from a variety of public historians from diverse backgrounds. Genealogists, artists, archivists, curators, and many more discussed their ground-breaking work and multifaceted approaches to history. Inspired by this year’s theme “History on the Edge” at the National Council on Public History (NCPH) conference, Joana wanted to incorporate projects that infused an element of risk-taking. Some of the presenters whose projects challenged the boundaries of public history included Annie Anderson from Eastern State Penitentiary, Ezra Nepon’s “Trans Histories of Existence, Resistance, and Brilliance” in collaboration with William Way LGBT Community Center, Maggie Schreiner’s “We Won’t Move: Tenants Organize in New York City at the Tamiment Library and Robert F. Wagner Labor Archives,” and many more. Following the initial presentations, everyone migrated to the East Room of the Meeting House where attendees were able to discuss the projects with the speakers. The format of this portion of the day has been termed “Public History Speed-Dating,” where attendees rotated tables every 15 minutes to discuss the speakers’ individual projects. Everyone then convened for the unconference portion of PubComm, which concluded the day. Attendees engaged in fruitful conversation and discussion, and everyone is looking forward to the sixth annual PubComm! Public History MA student Joana Arruda shares her perspective on a quick stint with the National Park Service. From March 9-13, I participated in a Park Break program along with seven other graduate students from various corners of the country. Sponsored by the George Wright Forum and the National Park Service (NPS), Park Break is an annual program that selects graduate students from all disciplines to work on projects at one natural and one cultural-based park. This year, Philadelphia’s own Independence National Historical Park was chosen as one of the sites. The staff at Independence asked Park Break students to create an exhibit for New Hall, a building located between 3rd and 4th Streets on Chestnut Streets. New Hall was built in 1791 and served as the War Department and the office of the nation’s first Secretary of War Henry Knox. Until recently, the building served as a military museum, but the staff hoped to incorporate the archaeological artifacts found there in the 1950s in a new exhibit. Additionally, they asked that we develop a digital exhibit to showcase our findings. With only five days at Independence, our work was cut out for us. Upon arrival, we toured New Hall and immediately began research in the Park’s Archives. We found evidence that after the War Department left Philadelphia for Washington, D.C. in 1800, New Hall had a variety of civilian uses throughout the nineteenth and twentieth centuries. For example, an architecture school was housed on the third floor of New Hall, which produced student John McArthur, Jr., architect of Philadelphia’s City Hall. We realized that New Hall had more important links to the city than we had realized. 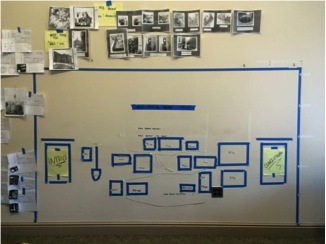 At this point, our team began thinking about how to visually organize our exhibit as well as the narrative that would tie it all together. New Hall continues to operate as a military museum, and we wanted to be conscious of the types of audiences that would come through. 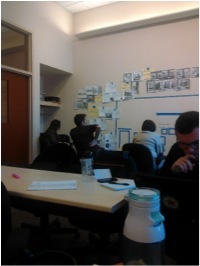 After much discussion, we decided to visually create an exhibit that recreated a timeline. However, we wanted to refrain from using vertical or horizontal timelines not because only because they could be tedious, but they because would not represent as well the simultaneity of events. What we came up with was to reconstruct the stratigraphic layers from the archaeological record. Each drawn layer would show the artifacts found there, and these artifacts would be laid out in several cases. A half-scale model of the stratigraphic layers with the artifacts found at New Hall in excavations conducted in the 1950s by archaeologists Bruce Powell and Michael Schumacher. The archaeological record until 1900 was surprisingly complete, but we had no such materials following this period. We chose to represent the twentieth century with photographs from the Archives. Throughout the process, we split up into several groups to work on different areas of the project that best suited our strengths. 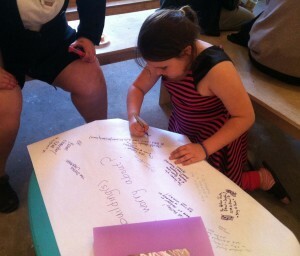 The students trained in landscape architecture, museology, and architecture worked on the visual display. Myself and another public history student banded together to write the historical narrative and the text panels that would hang at the exhibit. We wanted to focus on the building’s significance on several levels. We did so by incorporating the history of the building in its own right, as well as its connections to local Philadelphia history and the larger national story. Our narrative also placed New Hall within the context of the entire park. Two other students focused on the military’s contribution to the history of New Hall, and connected it to the issues of the modern-day military-industrial complex, much of which has its origins with the War Department of the 1790s. This overall work was also developed to appear in a digital exhibit on a phone app. On Friday morning, we presented our exhibit proposal to the staff team, including the curator, archaeologist, and various other members at Independence. 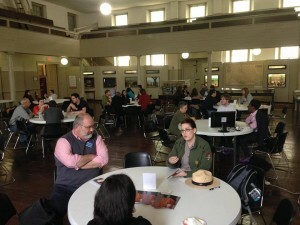 We had met many of them throughout the week, some of who discussed their careers with the National Park Service. Our team outlined our proposal to the Independence team, and the staff had high praise about the extensive work we had completed in just a few days. The group, along with the staff, had a larger conversation about audience expectations, the narrative we had created, and the use of archaeology to spark interest in New Hall. As a public history graduate student, I’m often exposed to conversations about interdisciplinary collaboration, but I’ve found this to be a rare find in some projects. However, Park Break was a great way to put this challenge to the test in an idealized setting. While I was comfortable being a voice for the historical process in the project, I was also thrust out of my comfort zone when I had to learn quickly how to understand the perspective of others in the group who thought of things that had never occurred to me about spatial design or visitor patterns. It was a great experience for me to think about public projects from the perspective of those outside of the field. This experience gave me the opportunity to understand the face of public history in a large institution like that of the NPS. It will be interesting to see how the NPS implements our exhibit proposal into a physical exhibit in the coming year. 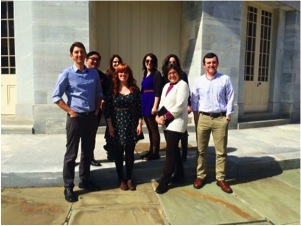 Myself along with the Park Break 2015 Team at Independence National Historical Park! Creating an exhibit with virtually no restrictions was a liberating way to do history. The NPS, of course, has limits that it must adhere to, but I think we created a useful product that enhances what the park aims to do for its visitors. Funding from The Barra Foundation also supports Philadelphia Public History Truck becoming a permanent part of Temple’s M.A. in Public History, guaranteeing academic credits for graduate students who manage the mobile museum. PHILADELPHIA (September 7, 2014) – The Center for Public History at Temple University is proud to announce a generous award of $85,000 from The Barra Foundation in support of the Philadelphia Public History Truck. Funding will support a full, 12-month exhibit cycle in North Philadelphia, will underwrite a new web portal where Philadelphians will have permanent access to the museum’s extensive oral history archives and will help the truck become a permanent feature in the university’s master’s in public history program. History Truck is an actual, renovated food truck currently under direction of Erin Bernard, who first conceived the project as part of her master’s thesis. The truck is a mobile museum that tells the story of Philadelphia neighborhoods. Unlike other museums, History Truck creates exhibits collaboratively with its audiences. Young historians from Temple’s graduate program in Public History travel the city inviting neighbors to design exhibits about their own community’s history. Exhibits are planned directly out of the back of the truck at neighborhood block parties. History Truck aspires to bring history to Philadelphians who have not typically felt welcomed in museums or – more significantly – haven’t been invited to participate. A key feature of The Barra Foundation grant is its support for the Center for Public History’s plan to integrate History Truck into Temple’s MA program in Public History. The center plans for each new cohort of students to manage the truck for one year. Students will receive academic credit for developing community partnerships, crafting exhibits, compiling oral histories and managing History Truck’s budget—all skills that transfer directly to public history careers. History Truck’s upcoming events include a stop at the Urban Creators’ Home Grown Jazz Festival at Bartram’s Garden, 5400 Lindbergh Boulevard, on Saturday, September 13. It will host its first block party of the season at the Urban Creators farm, 2315 N. 11th St., on Saturday, October 25. For more information about the Philadelphia Public History Truck, please visit https://sites.temple.edu/centerforpublichistory. Temple’s Center for Public History originated by 1985 to raise awareness of Philadelphia’s recent past and to improve training for historians seeking work beyond universities. Today, the CPH sustains an intensive two-year masters program in Public History with specialties in museum and historic site management, digital history, historical interpretation, and community history. The Barra Foundation invests in innovation to inspire change that strengthens communities in the Greater Philadelphia region. It provides approximately $4 million in annual grants that are focused on supporting innovation in and across the fields Arts & Culture, Education, Health and Human Services. Congratulations to Dana Dorman (’09), who just signed on as the Archivist and Librarian at the Historical Society of Haddonfield, New Jersey! Photographs I found while researching at the Temple University Special Collections Research Center that were used in the History Truck exhibit Manufacturing Fire. As an undergraduate history student with an expressed interest in public history, I was delighted and honored when offered a position as an undergraduate research assistant for the Philadelphia Public History Truck for the Spring 2014 semester. Before working with the History Truck, I had no in depth experience with community history, so I was nervous but extremely excited to work with the chief curator and founder of the History Truck, Erin Bernard, in the East Kensington community! I began in February 2014 in the midst of preparations for History Truck’s first stationary exhibit, Manufacturing Fire, which was located at Little Berlin, an artist collective in East Kensington during the month of April. Reflection and response station in the Manufacturing Fire exhibit. As the undergraduate research assistant, I spent much of my time researching fires in the East Kensington area at the Temple University Special Collections Research Center and the Historical Society of Pennsylvania. 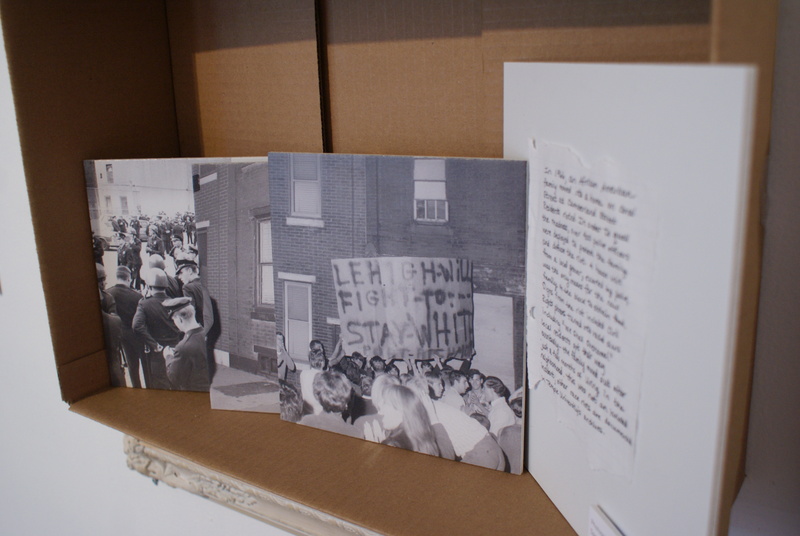 In addition to researching, I also transcribed oral histories from the block party in East Kensington last fall, attended Kensington Neighborhood Association (EKNA) meetings, participated in exhibit planning meetings, and helped with exhibit set up and break-down. The opening night of Manufacturing Fire was absolutely remarkable. Members of the East Kensington community, artists, and historians mingled, reflected and ate soup based on an original Kensington Soup Society recipe that Erin discovered while researching at the Historical Society of Pennsylvania, which was delightfully nerdy! 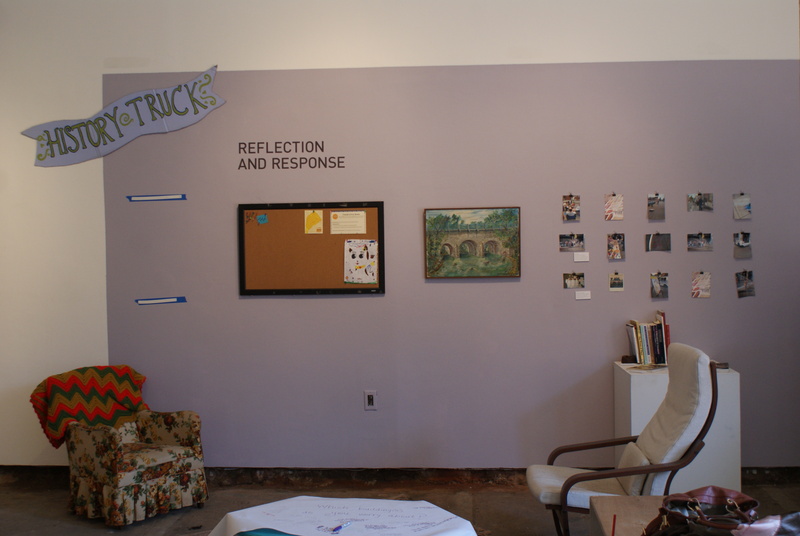 There was a listening station, where visitors could listen to oral histories taken from the block-party, a memory map, and a reflection area where people could think about the exhibit and record what buildings they were worried about in their neighborhood. Residents of East Kensington loved seeing their community’s history, and non-community members loved learning about the area’s history. Young resident of East Kensington responding to the question “What building(s) do you worry about?” She wrote that she was worried about her house. It has been a privilege and pleasure to work with the History Truck in East Kensington. I have learned so much, seeing first-hand the value of sharing authority and creating accessibility while interpreting history. The exhibit was inspired by the community, as it was based on oral histories taken from community members, artifacts provided by community members, and original artworks inspired by the oral histories. The interdisciplinary and collective nature of the History Truck produces a new type of history, one that is incredibly progressive and connects the past with the present in a personal and meaningful way. Working with Erin and the Public History Truck has exposed me to new ways of interpreting history and sharing authority, and I am excited to see what the History Truck will uncover in its most recent community cycle, North Philadelphia! Great discussion here by TU Public History MA student, Mary O’Neil, of her method for visualizing the Civic Club of Philadelphia’s attempts to place women on ward school boards during the early 20th century. The making of Funeral for a Home, featuring Temple’s Patrick Grossi. Gail Friedman, Public History MA student, examines labor activism in turn-of-the-century Philadelphia here.